The Hollywood Burlesque Festival was established to ensure the ongoing tradition of burlesque in the arts; to raise awareness and appreciation of an art form that both empowers and admires the human figure. Burlesque shows were precursors to vaudeville. Vaudville was the precursor to the American musical. Burlesque is the “grandfather” of the American musical! American burlesque is a genre of the modern variety show. 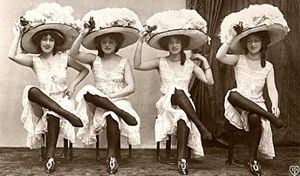 Derived from elements of Victorian burlesque, music hall and minstrel shows, burlesque shows in America became popular in the 1860s and evolved to feature ribald comedy (lewd jokes) and female striptease. By the early 20th century, burlesque in America was presented as a populist blend of satire, performance art, music hall, and adult entertainment, featuring striptease and broad comedy acts.